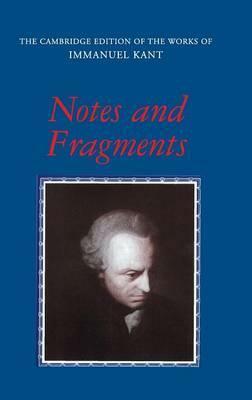 This volume provides an extensive translation of the notes and fragments that survived Kant's death in 1804. These include marginalia, lecture notes, and sketches and drafts for his published works. They are important as an indispensable resource for understanding Kant's intellectual development and published works, casting fresh light on Kant's conception of his own philosophical methods and his relations to his predecessors, as well as on central doctrines of his work such as the theory of space, time and categories, the refutations of scepticism and metaphysical dogmatism, the theory of the value of freedom and the possibility of free will, the conception of God, the theory of beauty, and much more. General editor's preface; Introduction; Acknowledgements; 1. Selections from the notes on the Observations on the Feeling of the Beautiful and Sublime; 2. Notes on logic; 3. Notes on metaphysics; 4. Notes on moral philosophy; 5. Notes on aesthetics; Notes; Glossary; Index to Kant's texts. Paul Guyer is Professor of Philosophy and Florence R. C. Murray Professor in the Humanities at the University of Pennsylvania. Curtis Bowman has taught at the University of Pennsylvania, Bryn Mawr, and Haverford College. Frederick Rauscher is Assistant Professor of Philosophy at Michigan State University.